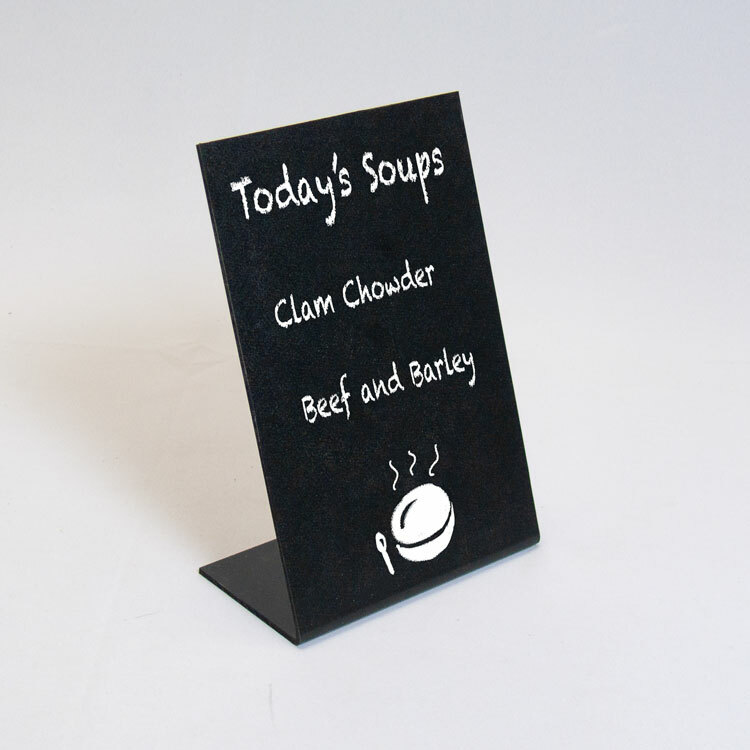 Combine the elegant look of wood and chalkboard to provide information to your customers! 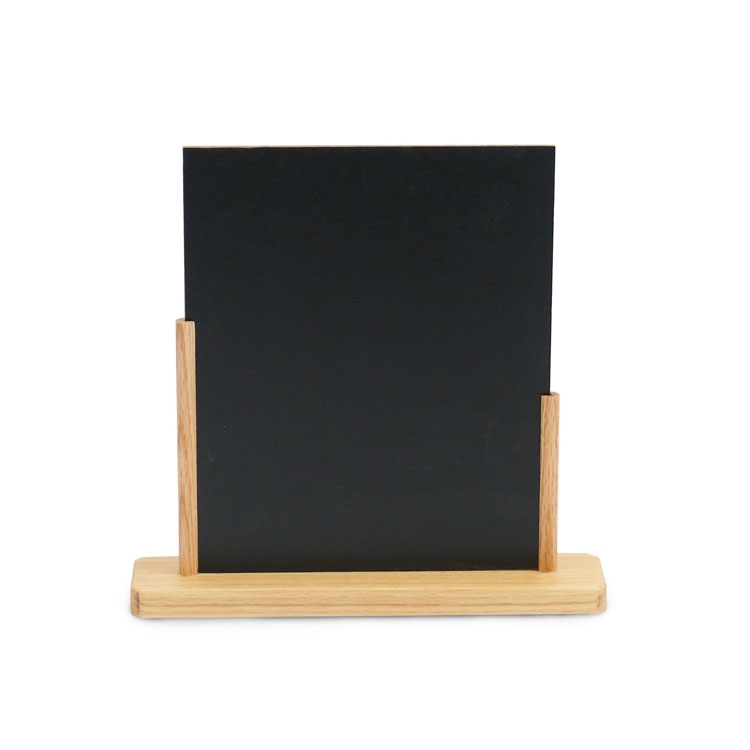 This holder features a solid wood base and a 2-sided 4x6 chalkboard. 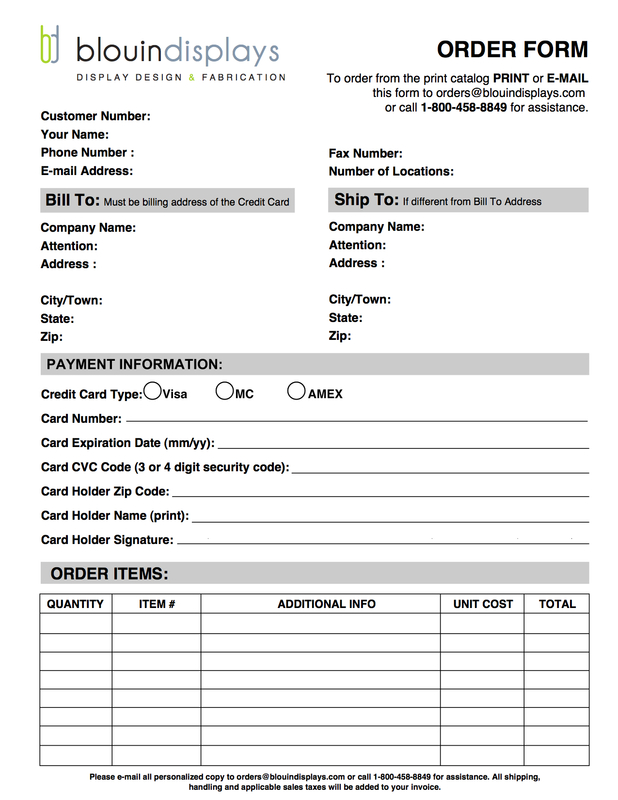 Imprint your company name and logo on the base! Setup fee applies. Please note: We do not guarantee liquid chalk pens will work on this chalkboard. 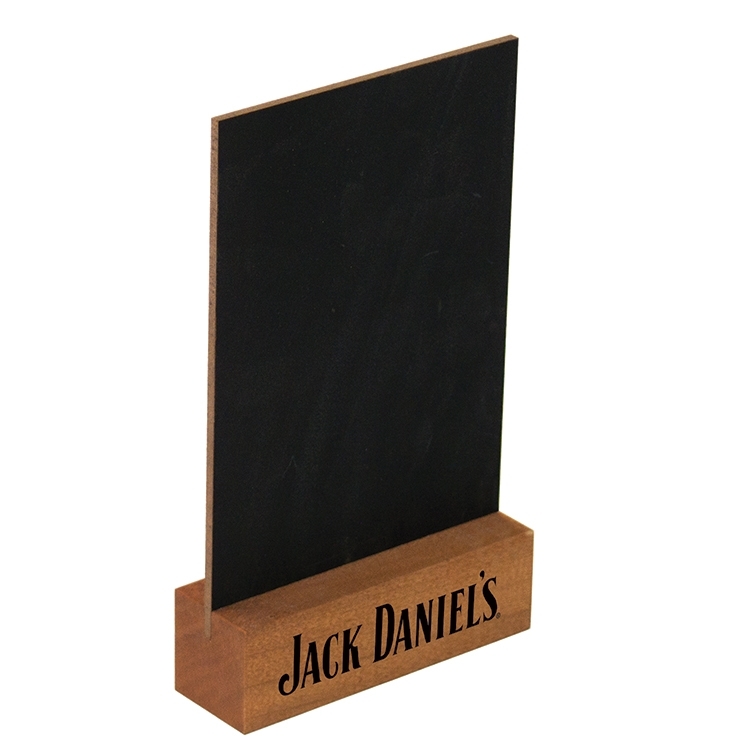 Combine the elegant look of wood and chalkboard to provide information to your customers! 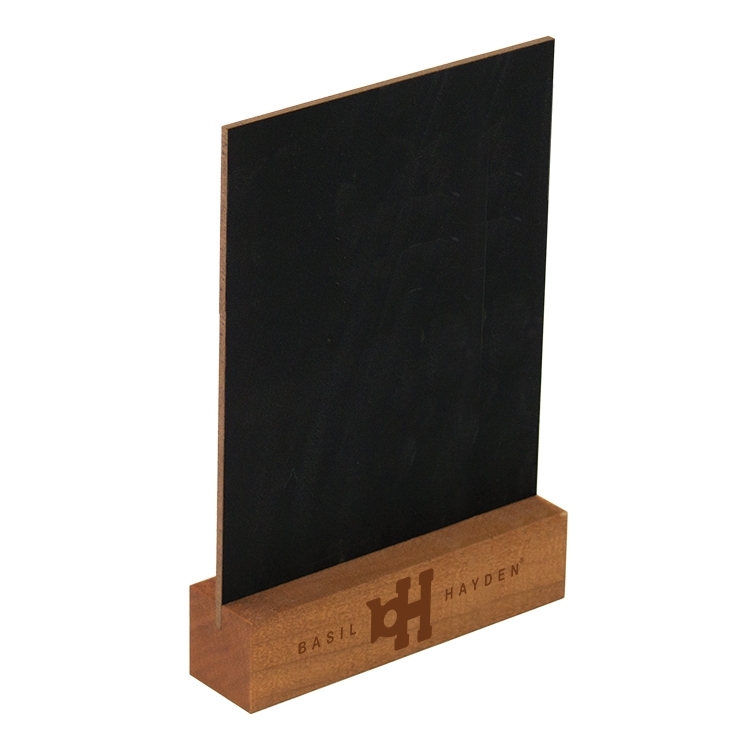 This holder features a solid wood base and a 2-sided 5x7 chalkboard. 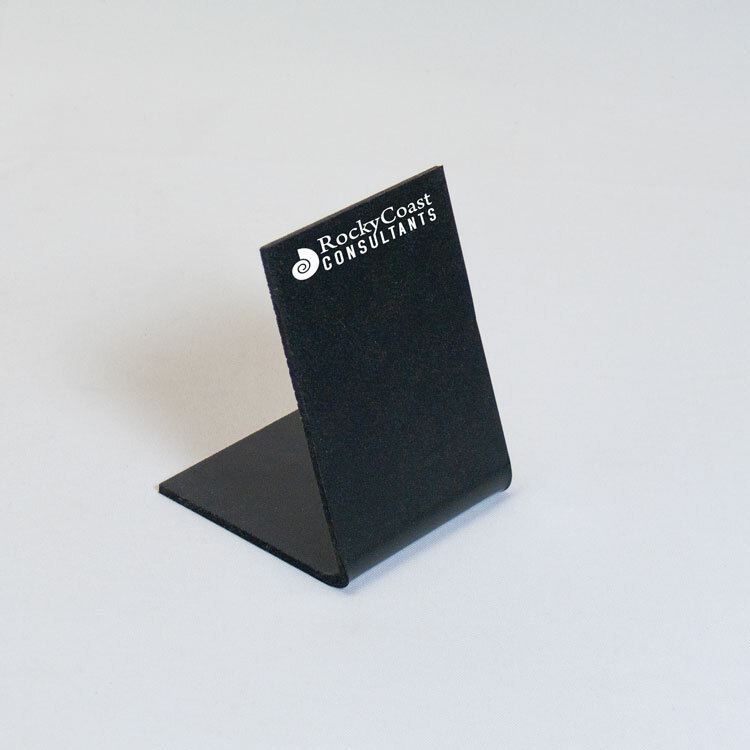 Imprint your company name and logo on the base! Setup fee applies. Please note: We do not guarantee liquid chalk pens will work on this chalkboard. 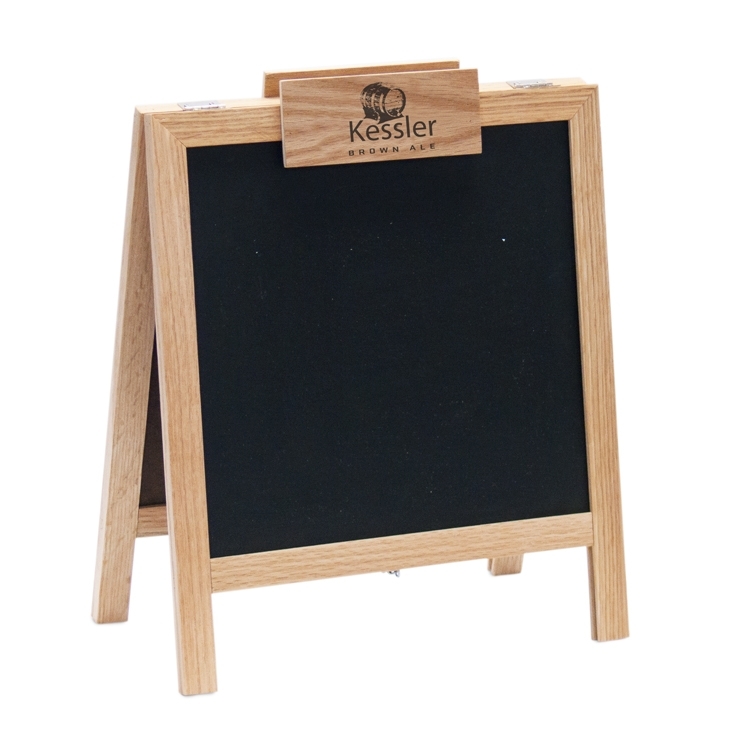 Combine the elegant look of wood and chalkboard to provide information to your customers! 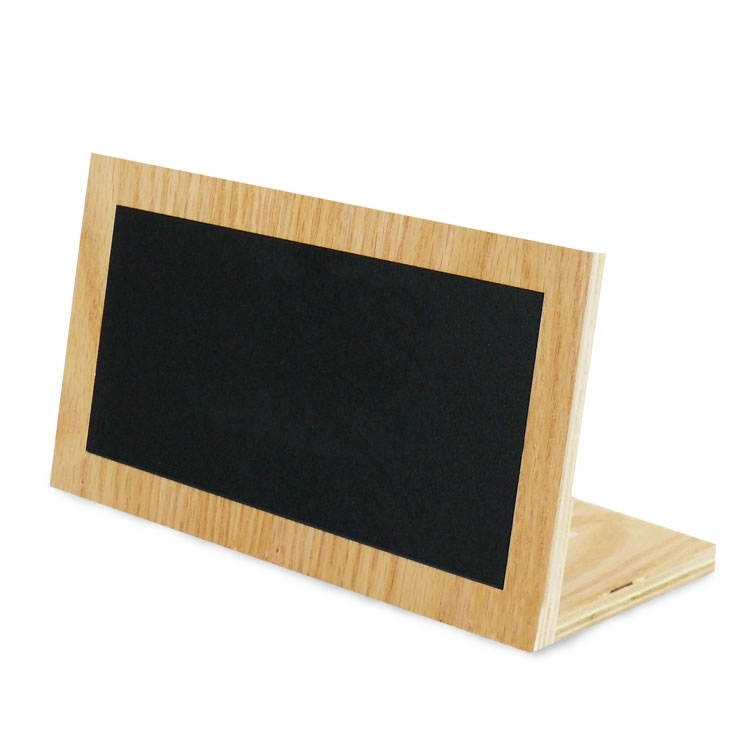 This holder features a solid wood base and a 2-sided 8.5x11 chalkboard. 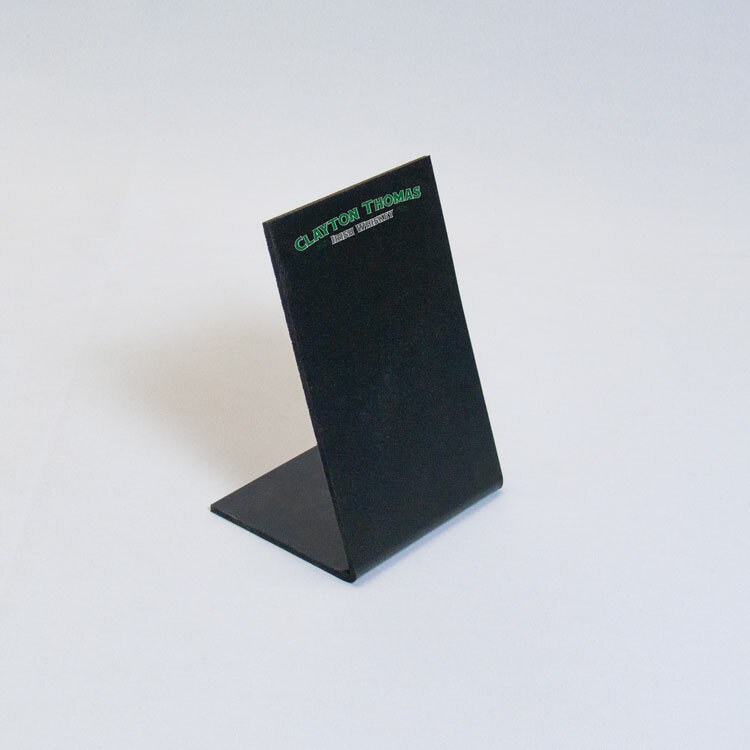 Imprint your company name and logo on the base! Setup fee applies. Please note: We do not guarantee liquid chalk pens will work on this chalkboard. This beautiful solid oak wood frame has a hinged top to easily swing open. 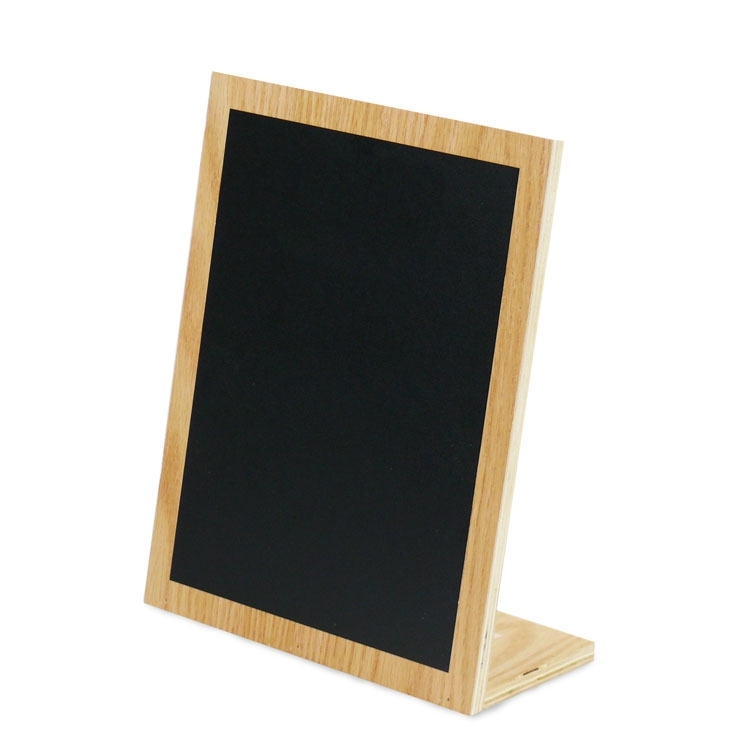 10x10 chalkboard on each side provides ample room to display current promotions/news. IMPRINTING IS ADDITIONAL - PLEASE CALL FOR QUOTE Note: We cannot guarantee liquid chalkboard pens will work with this product. 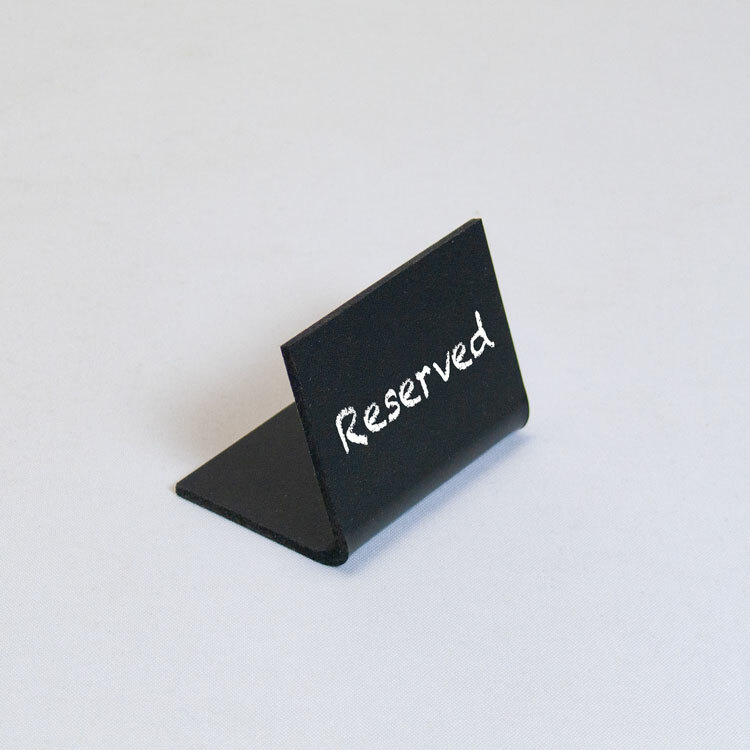 These mini chalkboard stands are perfect for table numbers, buffet table setting, name tags, garden tag names, wedding decor, place-card holders or just anything that can use a cute tag. Note: We cannot guarantee liquid chalkboard pens will work with this product. 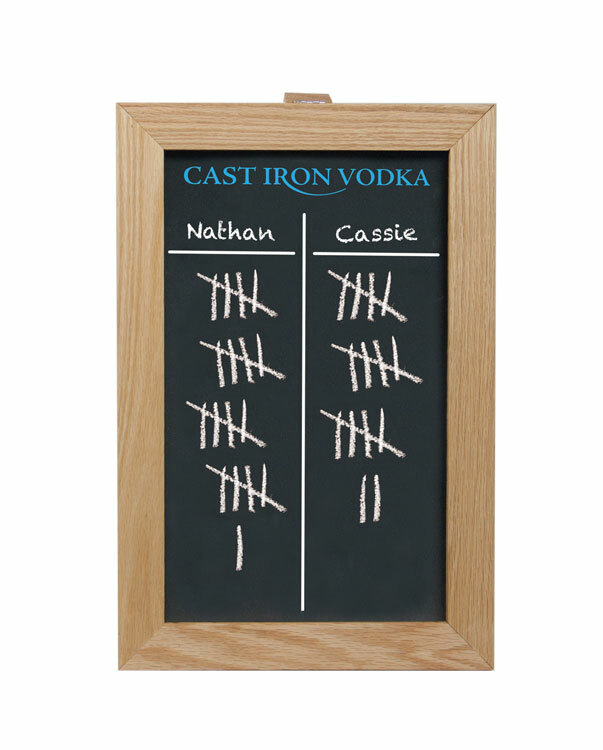 Keep score of your games with this convenient chalkboard. Set it up on a tabletop or bar with the hinge stand. Choose from our standard wood finishes.Customize with an imprint - call today for details! Please note: we cannot guarantee liquid chalk markers will work on this surface. This beautiful solid oak wood frame keeps up with your changing promotions and comes apart for easy storage. 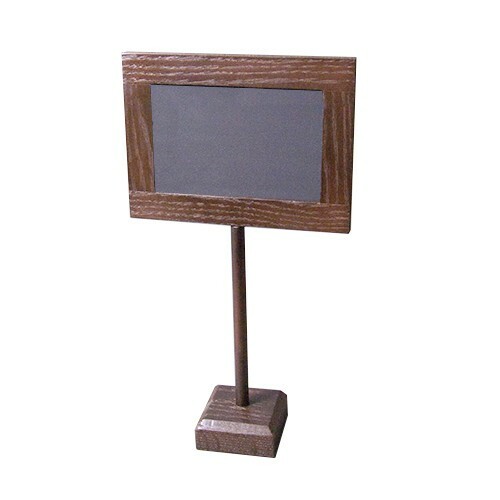 8" x 10" chalkboard on each side provides ample room to display current promotions/news. IMPRINTING IS ADDITIONAL - PLEASE CALL FOR QUOTE Note: We cannot guarantee liquid chalkboard pens will work with this product. 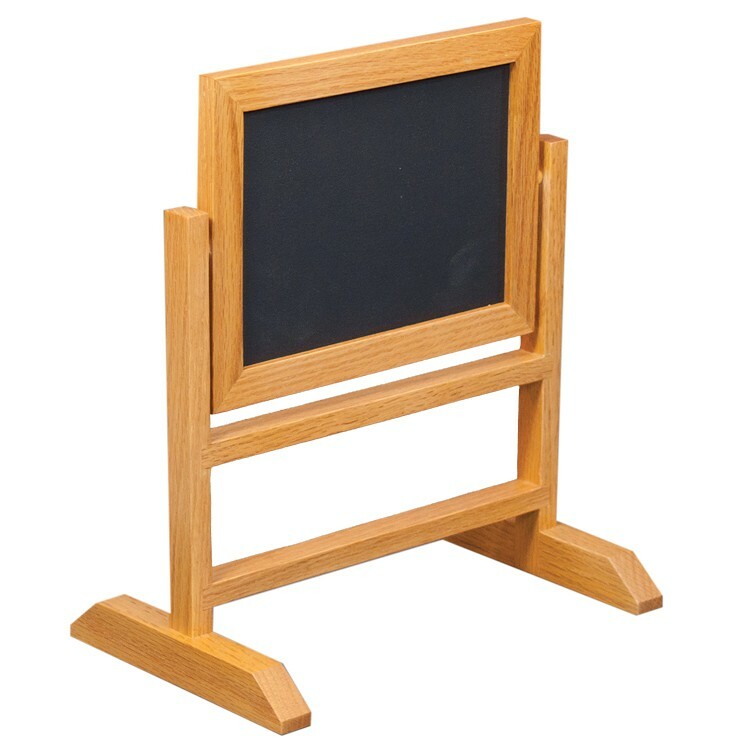 Countertop Easel Style Frameless Chalkboard - 7" x 7"
• Sealed 1/2" MDF with a stylish full coverage chalkboard finish • Chalkboad adhered to 3-leg solid oak easel • Crisp, high definition imprinting available • Custom sizes available - call today! IMPRINTING IS ADDITIONAL - PLEASE CALL FOR QUOTE Note: We cannot guarantee liquid chalkboard pens will work with this product. 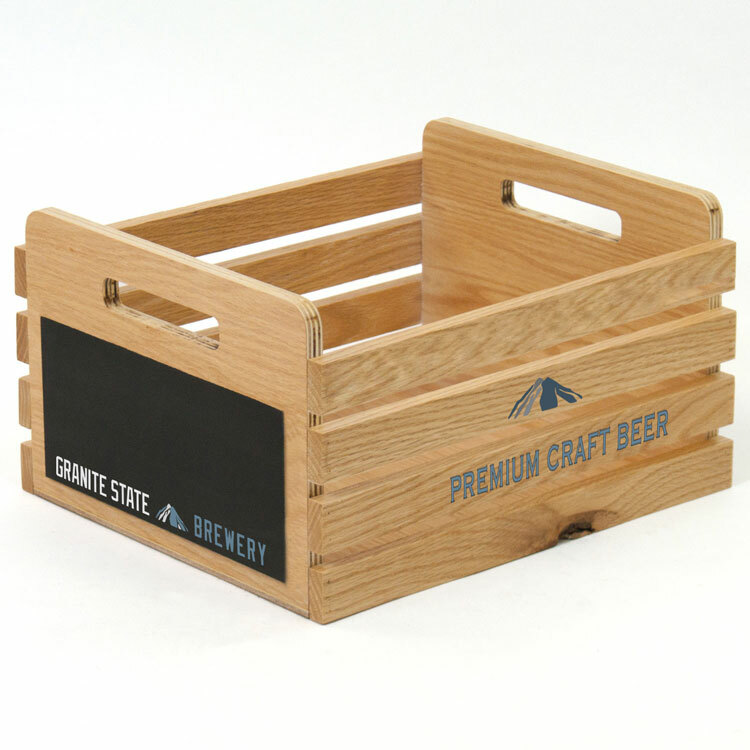 This wood display crate is ideal for use as a merchandise display or carrying case! Made of solid hardwood – available in any of our standard finishes. Measuring 10"w x 7"h this crate can provide visual interest to any setting while the chalkboard sides allow you to add your personal touch. 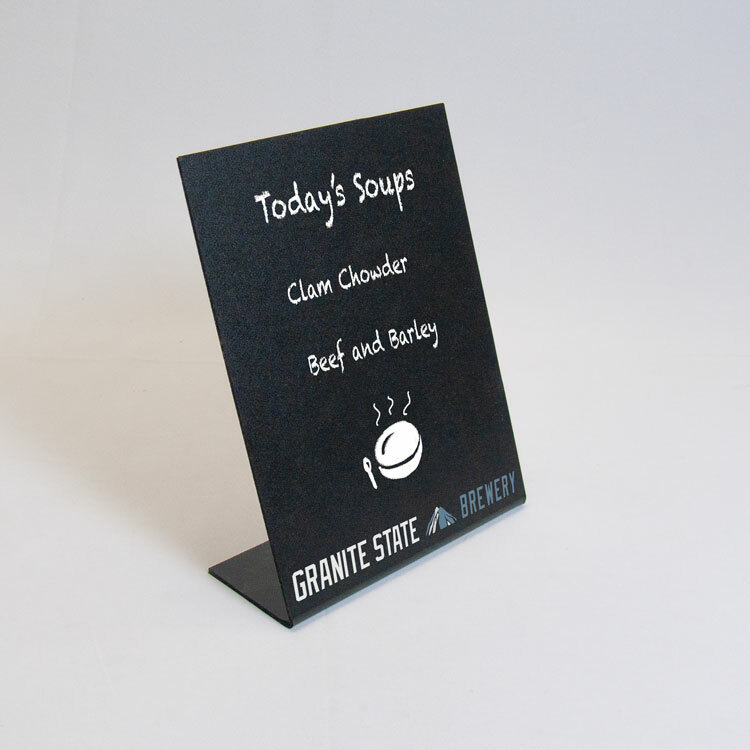 Specify your needs with the chalkboard vinyl front and back, or imprint directly onto the chalkboard face. Custom options available, call today for details! 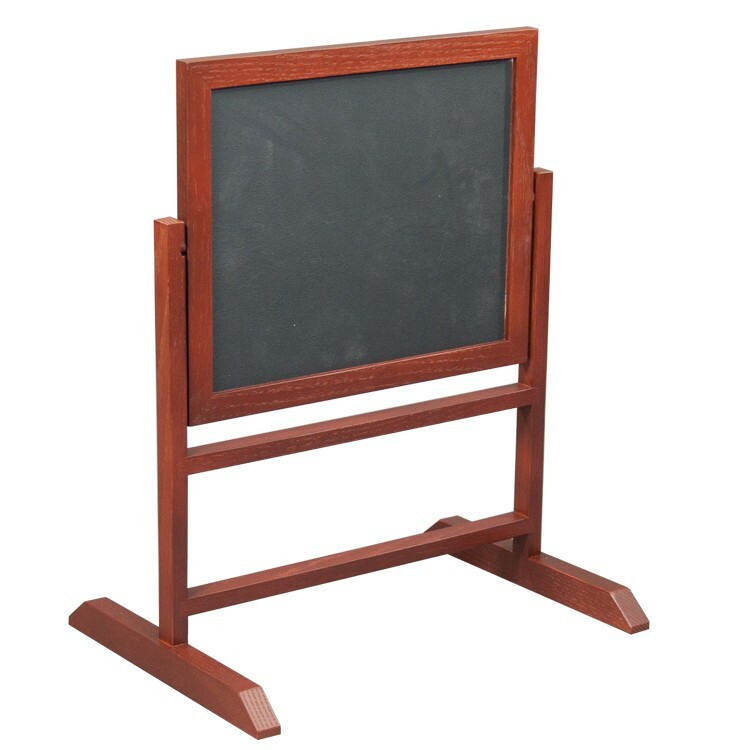 Countertop Chalk Board with Rectangular Base - 9"x11"
This beautiful solid oak wood frame has a hinged top to easily swing open. 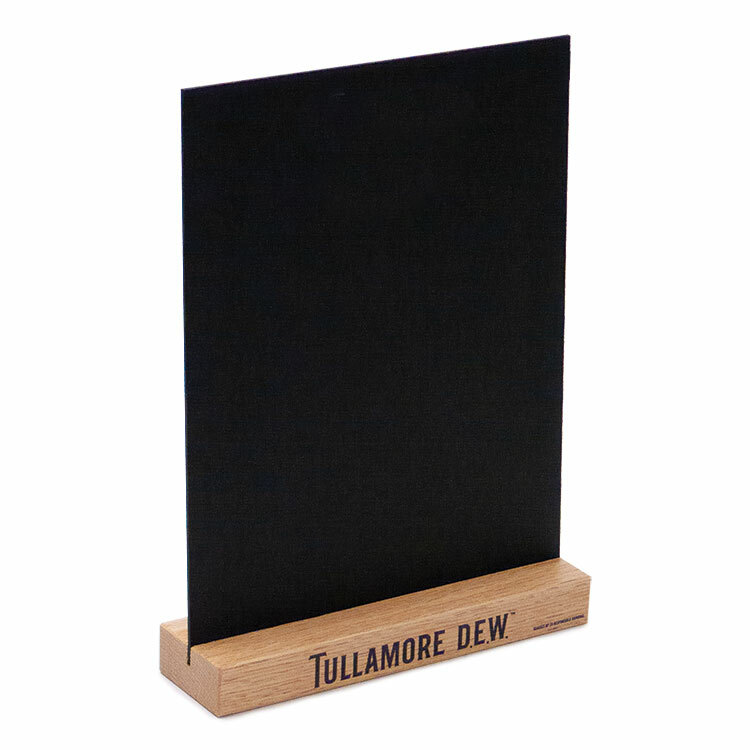 7x5 chalkboard on each side provides ample room to display current promotions/news. IMPRINTING IS ADDITIONAL - PLEASE CALL FOR QUOTE Note: We cannot guarantee liquid chalkboard pens will work with this product. 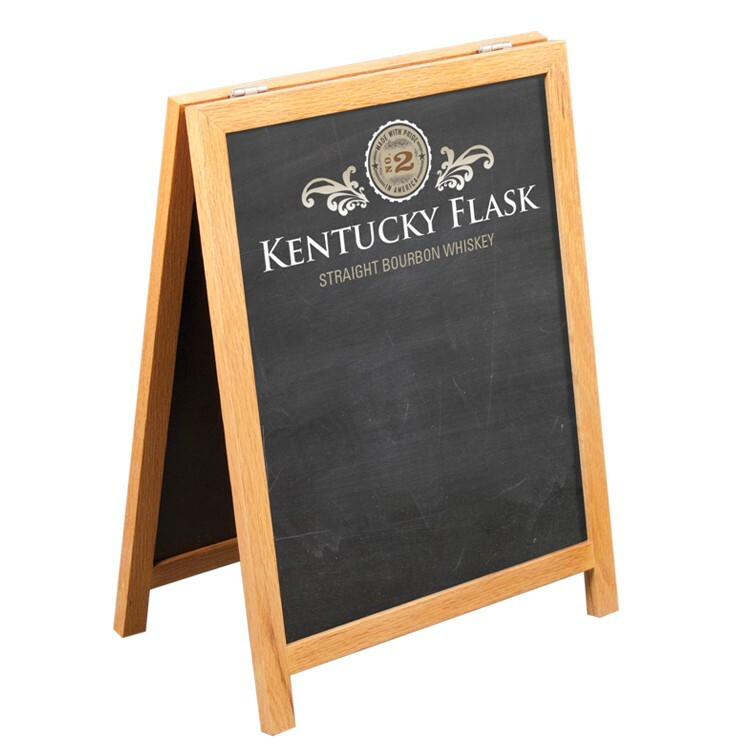 • Sealed MDF with a stylish full coverage chalkboard finish • Durable chain included for mounting • Crisp, high definition imprinting available • Custom sizes available - call today! IMPRINTING IS ADDITIONAL - PLEASE CALL FOR QUOTE Note: We cannot guarantee liquid chalkboard pens will work with this product. 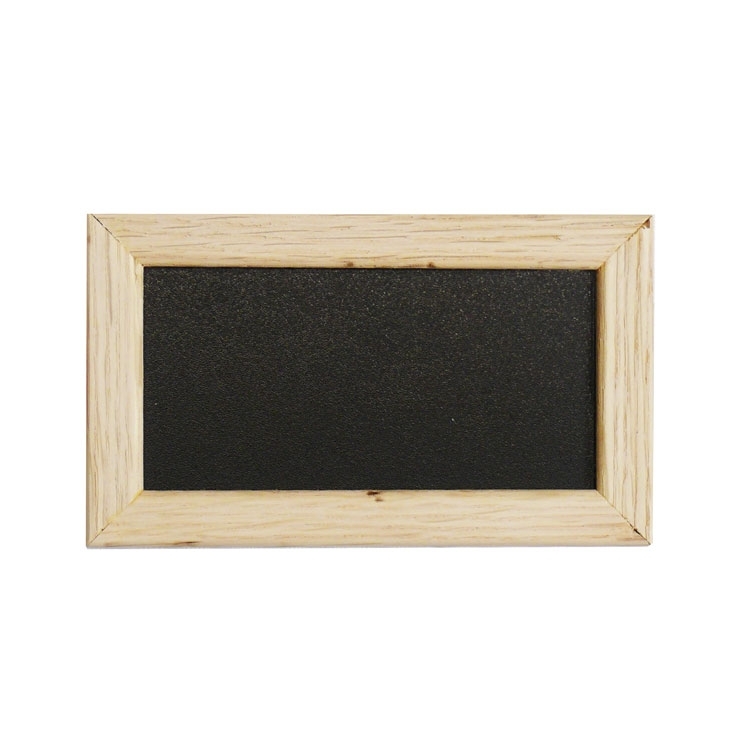 American made miniature wall mount adhering chalk boards. Great for name tags for events/weddings etc. Call today to get yours! 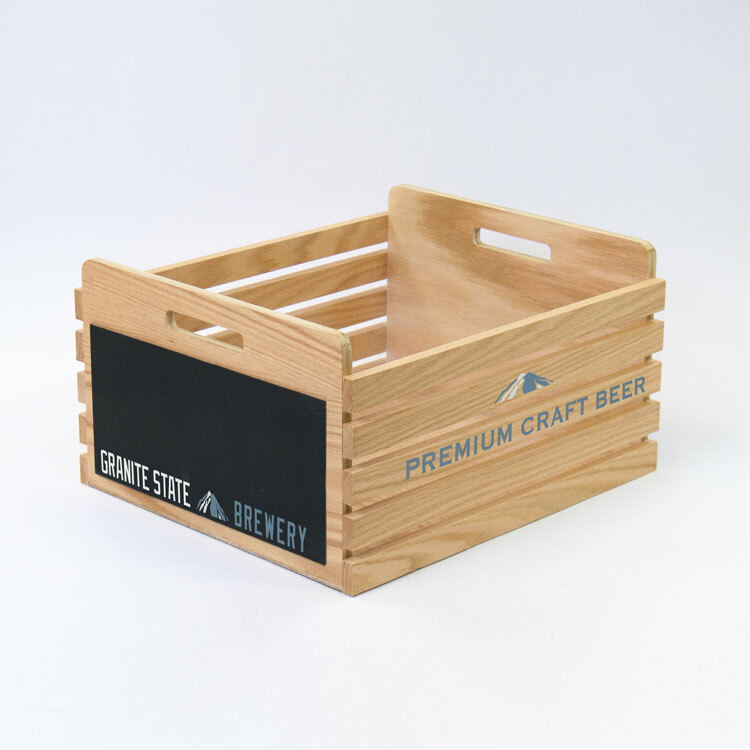 This wood display crate is ideal for use as a merchandise display or carrying case! Made of solid hardwood – available in any of our standard finishes. Measuring 14"w x 9"h this crate can provide visual interest to any setting while the chalkboard sides allow you to add your personal touch. 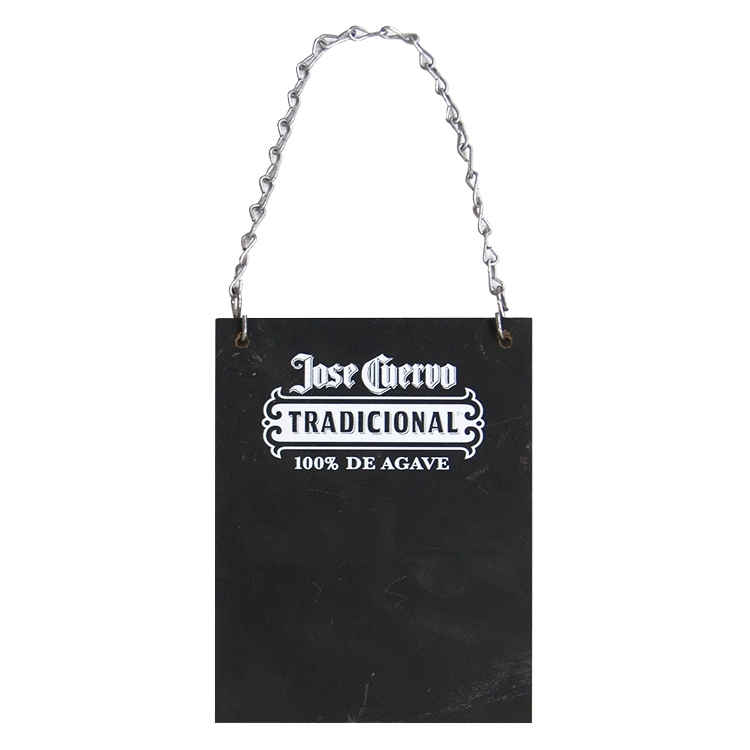 Specify your needs with the chalkboard vinyl front and back, or imprint directly onto the chalkboard face. Custom options available, call today for details! This beautiful solid oak wood frame has a hinged top to easily swing open. 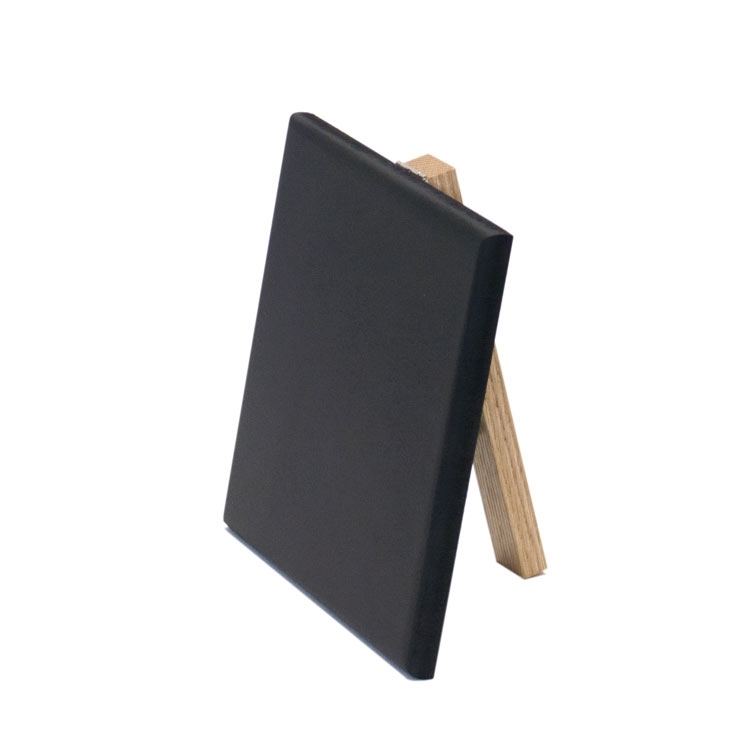 10x10 chalkboard with 5" x 2" header on each side provides ample room to display current promotions/news. IMPRINTING IS ADDITIONAL - PLEASE CALL FOR QUOTE Note: We cannot guarantee liquid chalkboard pens will work with this product. 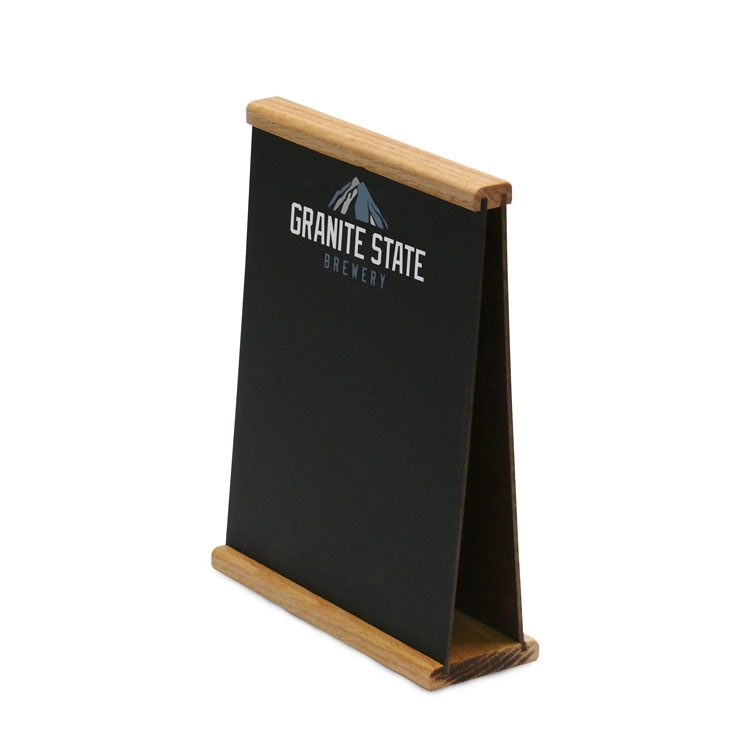 Our countertop chalkboard provides a clean and convenient format ideal for advertising your ever-changing promotions. 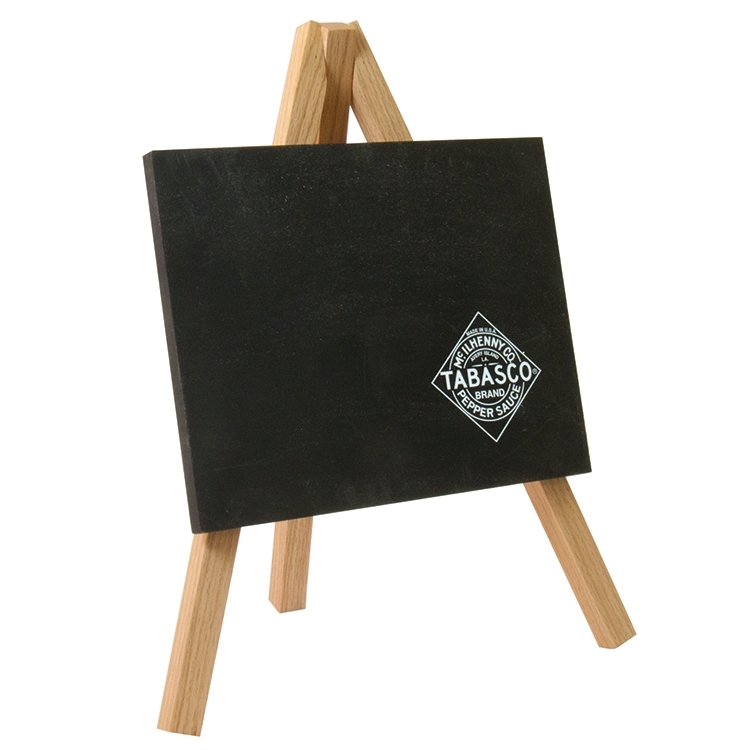 Brand your board by adding custom artwork or logo. Choose the size and color that works for you. Or call today for custom options! This beautiful solid oak wood frame has a hinged top to easily swing open. 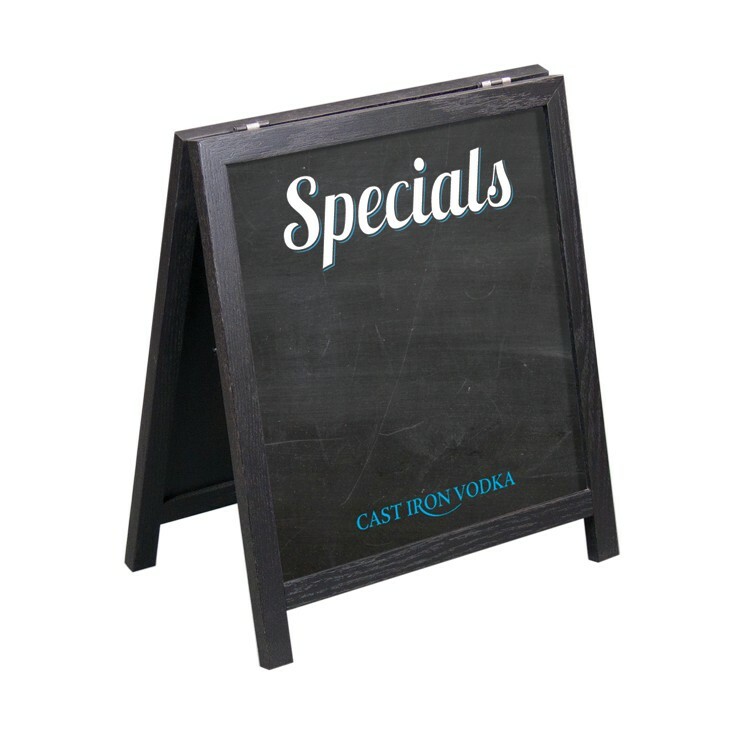 12x14 chalkboard on each side provides ample room to display current promotions/news. IMPRINTING IS ADDITIONAL - PLEASE CALL FOR QUOTE Note: We cannot guarantee liquid chalkboard pens will work with this product. This beautiful solid oak wood frame has a hinged top to easily swing open. 10x8 chalkboard on each side provides ample room to display current promotions/news. IMPRINTING IS ADDITIONAL - PLEASE CALL FOR QUOTE Note: We cannot guarantee liquid chalkboard pens will work with this product.